Lori is a graduate student in Literature and Writing Cultural Studies at California State University, San Marcos where she teaches composition while finishing her thesis on motherhood memoir and ekphrasis—vivid description depicting a visual work of art. She is married to one of America’s Hottest Husband’s (Redbook, July ’07), a fire captain. They have six kids (what woman in her right mind has six kids? ), ages 27-2, and are celebrating their 30th anniversary in November. Lori writes and paints from her studio overlooking their sustainable blueberry farm in Fallbrook. Her artwork has won several awards and been published in Strokes of Genius: The Best of Drawing by Northlight. Her autotheoretical essay “Ekphrastically Writing of Creative Mothering,” will be published in Mothers Creating/Writing Lives: Motherhood Memoirs, forthcoming in 2010. If you haven't done so already, you should definitely take a look at Lori's award winning story, "Removing the Mask." When you've finished reading, return here for a chat with the writer. WOW! : Congratulations on placing in the Summer 2009 Flash Fiction Contest! I read in your bio that you’re completing your thesis on motherhood memoir and ekphrasis. I am fascinated by that idea. Could you tell us a little more about it? Lori: Ekphrasis (ek=out+phrasis=speak) denotes art that speaks out, often poetically. A visual work of art gives rise to a verbal work. For example Homer's "The Shield of Achilles" in the Iliad, or Shelley's "On the Medusa by Leonardo Da Vinci." As a mother-artist who really wants to write, I found ekphrasis as a way to use the art I've created over the past 15-20 years, much of it responding to mothering, using my children as models-- often our oldest daughter who trained with the Joffrey Ballet at 17. I always wanted to write, but I got caught up in art b/c it was successful and it provided a visual map to return to between the many interruptions of mothering. WOW! : That is such an interesting idea, and a great way to combine writing and other art forms. How has your work on your thesis inspired “Removing the Mask”? 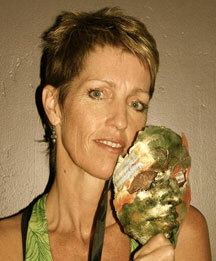 Lori: The mask, created about 15 years ago, is one of many pieces of art in my studio and home. Art has its own story to tell, something I realized recently when I returned to get a Master's degree in writing as a way to force myself back to my desk. The paintings and sculptures speak stories I didn't know were there until I started listening, writing. In this way, I'm rediscovering myself and a whole new world in my own art. WOW! : I love the idea of art and sculptures speaking their own stories. And it's great that you are able to rediscover yourself through your art. Art and writing can be so fulfilling and rewarding, but they come with their challenges, too. As a writer, what is your biggest challenge and how do you overcome it? Lori: Constant interruptions, including the internal ones of a manic mind. I collage the interruptions into my work, allowing them to add to and subtract from the story, memoir, or essay I'm writing. My thesis is a fictocritical response to the work of other mother-writer-artists- Fanny Howe who was my mentor at UCSD in the late 80's, and Bernadette Mayer, a beat poet who wrote an epic prose poem "Midwinter Day" on December 22, 1978, Winter Solstice, the shortest day of the year. This book is the epitome of alternative motherhood memoir. She was a mother of two small children at the time she wrote it. These writers provide incredible inspiration. WOW! : With six children, a husband, a blueberry farm, teaching and thesis writing it sounds like you’re a busy woman! What are some of your tricks to find time and space to create art? Lori: As women and writers, we find creative spaces where our minds and bodies dwell and thrive, spaces that drive creativity. Ekphrasis- the space between seeing and saying, between painting and writing is a liminal space, a threshold where confusion presages creativity, bringing order out of chaos. By grace, I am surrounded by a great group of supportive people, but being a mother is confusing. Writing and art help me sort through the tangles, and I am blessed with a partner who encourages me and gives me space. In turn, I have more to give back to the partnership, motherhood, and writing. If there is a trick, it might be knowing what to give up and when. We are going to sell the farm, go travel, find some simple place to live where the ground is covered in pine needles and sometimes, snow; a place where we can write and ski and be together--follow our dreams. WOW! : That sounds like a great plan! Are there other writing or art projects you hope to create in the future? Lori: I'm writing a novel told from the perspective of the prostitute to whom Vincent Van Gogh gave his ear. I also have a surrealist novel that takes place along the Alcan Highway with a character who may only exist within a painting- I'm not sure yet- she hasn't told me. I'm writing a piece for a conference in March at UCBerkeley, Our Bodies, Our Shelves - "Ekphrasis as Exploration of the Feminist Maternal Body." I have a memoir "You Are Here: Dots on the Map of a Manic Motherhood." I have more short stories. All are driven by art in some way. WOW! : You definitely have your artistic plate full for the future! Good luck! What is the best advice you have ever received about your writing or art? Lori: Carpe Diem- Just do it. Sit your behind down and don't get up until you've written a certain amount of words or pages or minutes, even if it is only 15. I sit on a balance ball so I can bounce energy back to my cerebral cortex when it falls low. The ball allows me to exercise- swiveling the hips, raising the pelvic floor--while I write, important issues for women as we age. I turned 50 on Nov.1. The affirmation from WOW was a nice gift. Thank you. WOW! : You're welcome, Lori! You earned it! Congratulations with all of your accomplishments and we hope to see and read more of your art in the future!